Cinema loves coming-of-age stories. The examination of how adolescents navigate that period in their lives has and will always make for some excellent stories. 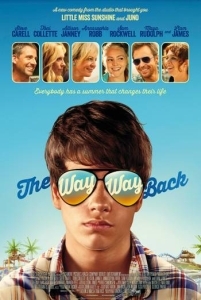 After winning an Oscar for penning Alexander Payne’s The Descendants (2011), Nat Faxon and Jim Rash have switched their focus from parents to teens for their directorial debut The Way, Way Back (2013), with charming results. Liam James plays the Duncan, an introverted 14-year-old who’s forced to spend his summer vacation with his divorced mother Pam (Toni Collette), her insensitive boyfriend Trent (Steve Carell), and Trent’s daughter Steph (Zoe Levin). Eager to avoid tension, Duncan spends his days in a funk. That all changes, however, when he discovers local water park ‘Water Wizz’. Striking an unlikely friendship with the park’s manager Owen (Sam Rockwell), he’s given a part-time job and slowly starts to come out of his shell. Duncan is an easy character to root for; James plays the despondent teen of the opening act so convincingly it’s almost hard to watch at times, which makes it that much more uplifting when his confidence levels begin to rise. To that end, it’s hard not to empathise with The Way, Way Back on some level. Whether you were an awkward teen or not, the struggle to find your identity is a rite of passage, and we can all see something of ourselves in him. Of course, it helps having someone to help steer us through those dark days. Luckily for Duncan that someone is Owen, and it’s easy to see why the insecure teen gravitates towards him, such is Owen’s happy-go-lucky nature. Rockwell’s charm-laden, scene-stealing turn is a delight to watch, and whilst the comedic beats are clearly natural and effortless for him, the heartfelt moments are executed with equal aplomb. Other characters are given appropriate amounts of screen time, and the commendable performances elevate the material. Collette does a great job portraying Pam’s growing angst as she desperately tries to keep her family together, whilst Maya Rudolph is efficient as Caitlin, the level-headed member of the Water Wizz team. Even Carell’s Trent, an unlikeable character who could easily have been one-note, is given depth and layers. Brilliant performances ensure that The Way, Way Back is both a funny and endearing addition to the coming-of-age genre, and Faxon and Rash’s tale is well worth seeking out as this year’s summer comes to a close.